Declawing is a common surgical procedure performed on cats in the United States and elsewhere. Many people who have cats take them to the veterinarian for declawing in order to spare their belongings from being damaged by feline claws. Is it possible that a type of surgery that is done routinely on so many cats by so many people could actually be inhumane and cruel? A declaw is the surgical removal, under anesthesia, of a cat's claws. In order to ensure that they don't grow back, an amputation must be done on each toe, down to the first joint. The procedure may be done with a scalpel blade, a guillotine-type nail trimmer, or a laser. Yes, you read that correctly: cats that are declawed experience 10 separate amputations (if only the front claws are removed: 18 if the back toes are also declawed). The cats are then expected to walk, run, and climb on these amputations and use a litter box, where the incisions are exposed to urine, feces, and litter. There are also risks associated with anesthesia and bleeding during the procedure. Once the cat makes it through the anesthesia and surgery for the declaw itself, his paws are usually bandaged, and he is kept in a cage for a night or two. Declawing is an extremely painful procedure! Because cats are stoic and hide pain well, feline patients may not receive enough pain medication. There is a risk that the incisions may open, resulting in bleeding and the risk of infection. Once a cat goes home following a declaw surgery, he must endure the pain of walking on the surgical sites. He may not move around much, becoming depressed and suffering in silence. Other cats may elect to continue playing and running as they normally would, not able to understand that these things result in pain, and these cats are at even greater risk of having their incisions break open. Litter box issues present a unique concern following declaw surgeries. Because many regular litter types have small particles that could enter a cat's toe incisions, causing irritation and infection, paper litter is often recommended for a period of time. Paper isn't a substrate that most cats are used to using as litter, so it's common for cats to begin urinating outside of the litter box when it is used. Cats may also urinate inappropriately following declaw surgery because they experience pain from their paws when they get in the litter box and paw around. These litter box problems may follow a cat throughout his life, causing him to be at risk for abandonment or worse. Cats are digitigrade walkers. This means that cats walk on and balance with their toes rather than the bottoms of their feet, like plantigrade walkers such as humans. When a cat is declawed, his balance is disrupted, and this can cause him to be more prone to falling injuries. 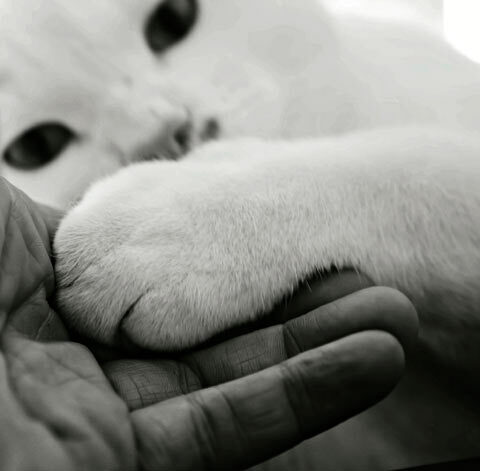 Declawing cats removes a big mechanism of defense. If a declawed cat goes outside or ever escapes to the outside, he will be much less able to survive if he is attacked by another animal. Declawed cats also have a higher tendency to bite humans because they feel insecure knowing they are unable to defend themselves with their claws. Providing enough cat scratching surfaces that have the qualities that are important to cats is one of the most important and effective ways for you to minimize cat scratching damage to your home. A cat that has access to scratching posts that meet their needs for marking territory, stretching muscles, and relieving stress will almost always choose to use them rather than the less attractive options of furniture and carpet. Training your cat to use a scratching post involves making the post as attractive as possible for scratching while simultaneously rendering undesirable any unacceptable surfaces that he may be using. 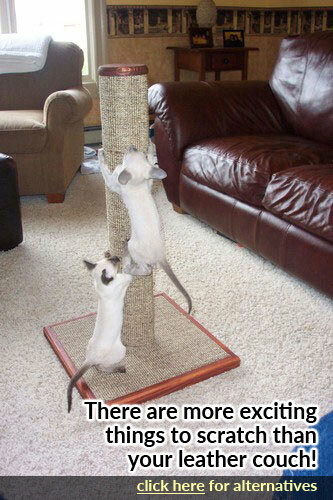 You can learn exactly how to do both things in the article "How to Train Your Cat or Kitten to Use a Scratching Post." Declawing is a painful, risk-filled procedure that is done only for the convenience of humans. There are only extremely rare instances, when claws are affected by a medical condition, that declawing cats can be considered anything but inhumane. Fortunately, there are alternative methods for dissuading cat scratching damage to your home. These methods are positive, humane, and they really work.